The National Park Service is performing rehabilitation work on the parking lot at the Lock 29 Trailhead for the Ohio & Erie Canal Towpath Trail in Peninsula. The lot will be CLOSED to all car, bicycle, and pedestrian traffic (no Towpath Trail access) beginning on Monday, August 20. The lot will be open for bicycle and pedestrian access to the Towpath Trail (no car parking) beginning on Friday, August 24. The lot will re-open to all traffic on Friday, August 31. The Overflow Parking Lot will remain open during this time. This lot is located further north on Mill Street, past the main Lock 29 lot, next to Terry Lumber Co.
From the store, go directly across Main Street (State Route 303). Turn right and take the sidewalk across the bridge. Take the first available LEFT onto Canal Street. 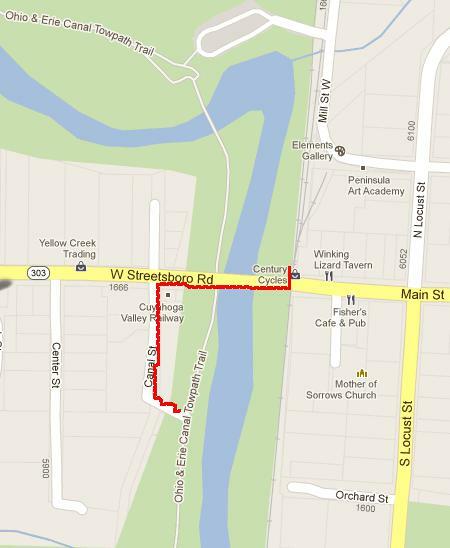 Follow Canal Street down to the Towpath Trail. Reverse the above directions to get from the Towpath Trail back to the store.